Personify grace in lace wearing this short plus-size wedding guest dress in blush pink. The off-the-shoulder sweetheart neckline on the lace plus party dress leads to lace cap sleeves and is elasticized at back for a perfect fit. With a delicate scalloped-trimmed hemline, this off-the-shoulder blush pink plus party dress is an ultra-feminine find. The soft jersey lining supports and provides necessary coverage for the beautiful lace overlay. A seam at the natural waistline adds definition and separates the flirty off-the-shoulder bodice from the pencil skirt. 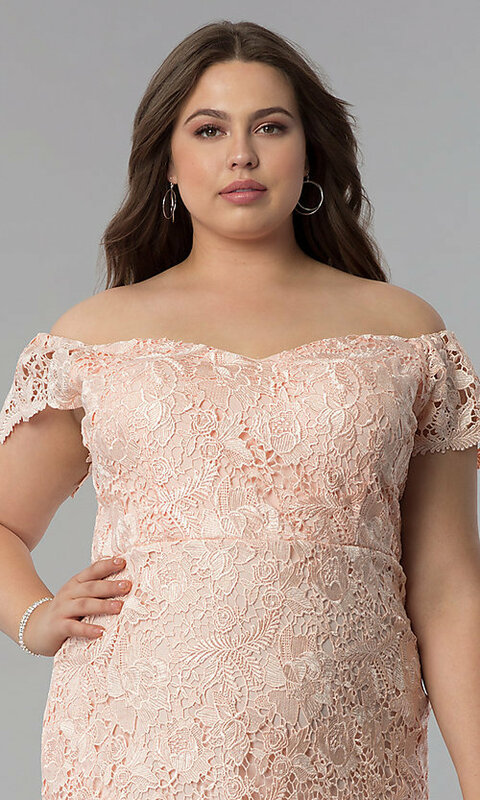 Simply slip into this blush pink plus-size wedding guest dress for a lovely look for the ceremony and celebrations to follow. 34", Hollow to Hem 39"